This post is a part of the Indiblogger 'It's your time to visit Melbourne NOW!' contest conducted in association with Tourism Victoria. Here I am blogging about the experiences I would like to bring back from Melbourne. 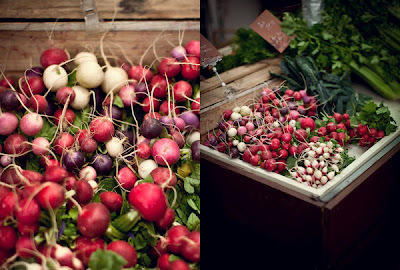 Think Melbourne and my mind conjures up pictures of food food and more food! Delicious, mind numbing and awe inspiring kind. I'm the kind of person who will transverse scorching desserts and wade through oceans in search of the rarest and most exquisite delicacies. In the foodie paradise called Melbourne, I wouldn't have to travel a lot for that perfect latte or a sensational Potted Pork. Every nook and cranny of Melbourne is brimming with amazing restaurants, cafes, bistros and bars. Melbourne is also a place where some of the greatest culinary experts and my food heroes cook to their heart's content.What wouldn't I give to step into George's (Chef George Calombaris) chic restaurant,'The Press Club' and taste his Granny's Baklava, to wander into the iconic Shannon Bennett's 'Vue de Monde' restaurant and savour art on plate or Gary Mehigan's 'Fenix and Maribyrong Boathouse'. big as our neighborhood wall! !Known as one of the world's greatest street art capitals, the streets of Melbourne is lit in color by vibrant stencils, paste-ups and murals. Artists create their colorful masterpieces in approved outdoor locations throughout the city. The colorful and vibrant artistic splendor provides an urban touch which is a stark contrast to the overall chick and cosmopolitan look of the city. This very same fact, makes it hop to the top of my list. I have already established myself as a foodie but a lesser known passion of mine is architecture. Melbourne has ways to satiate my hunger for food and architecture. 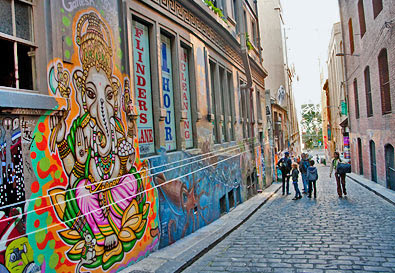 Each arcade and laneway of Melbourne has a personality and charm of its own. From Block Arcade’s Italian interior splendour to Melbourne’s oldest trading Royal Arcade, these historical icons will be a feast to any admirer of architecture. Every street here is like an unexplored territory. Walking through the lanes, we might stumble upon small, interesting shops with some amazing products! You can always find the perfect coffee or snack in the many cafes and eateries around. Munching on a freshly baked cookie, you can sit and enjoy the beauty of the laneways winding their way through the heart of this city! If you are looking for an out of the world experience, like me, you will appreciate this one. 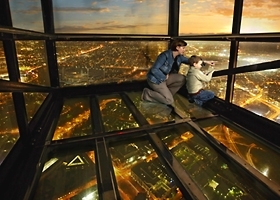 Eureka Skydeck 88 is the highest viewing platform in Southern Hemisphere.The switchable glass cube enclosing you will slide out from level 88 of Eureka Tower, giving you a terrific view of Melbourne. Now that's what I call, a room with a view! I have a thing for libraries. I just love looking at rows and rows of books. 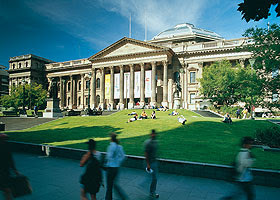 State Library of Victoria is not just another library. It is a Melbourne city landmark and cultural icon, a magnificent 19th-century building with some of the city’s most beautiful heritage interiors. It has an octagonal La Trobe Reading Room designed to hold over a million books and up to 500 readers. Its majestic domed ceiling, is an architectural delight. Yes, and it does have rows and rows of books amounting to over two million books, thousands of pictures, newspapers, maps, manuscripts, masses of audio, video and digital material –all reflecting the culture of Victoria over the past 150 years. The icing on the cake is the free exhibitions. So, I took a flight to Melbourne, but what if I landed in Greece instead? That is the feel that is promised when we step into Melbourne's Greek precinct!This is the perfect place for all my Grecian food fantasies. Lined with an array of restaurants and cafes the Lonsdale Street is a perfect destination for all the foodies. Among the innumerable Greek restaurants of the region, Stalactites restaurant is an essential stop for all. Winner of the Dine Out Award and Australian Achiever Awards for best Greek Restaurant,Stalactites's delicious menu includes mouth-watering dishes such as the famous Stalactites giros souvlaki, home made fresh dips, tasty grilled meats and rustic home style dishes from the Peloponnese region of Greece. And the latest Greek music is free with every meal! What more could one ask for! This is yet another place I'm dieing to visit. Yarra Valley is famous for their wineries which produce some of the country's best cool-climate variety of wine. To enjoy the scenic beauty of the valley and sip a nice glass of wine while brewers explain the story of the exquisite drink is going to be a an amazing experience. 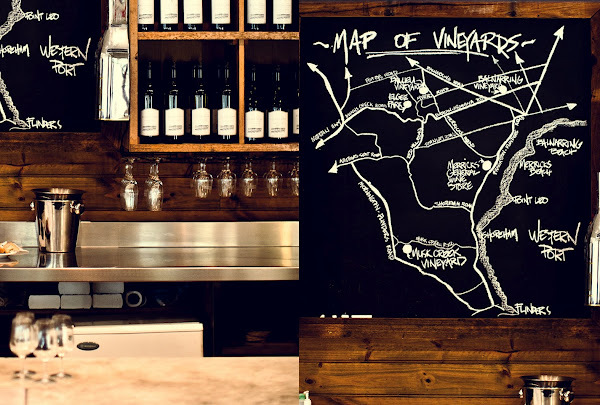 Cellar wine tasting is offered in many of the wineries and you can dine on local produce at winery restaurants.I'm so looking forward to this one! How will my trip be complete without shopping! 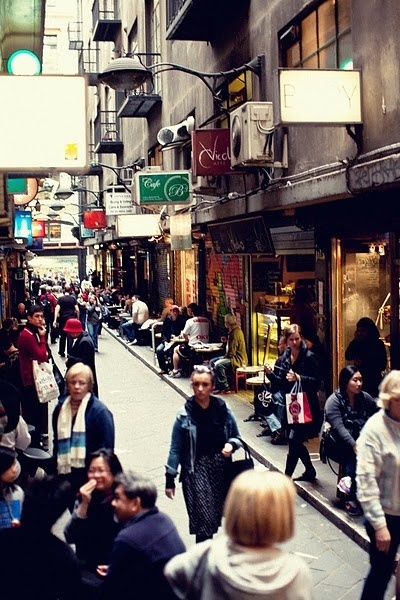 Queen Victoria market is the right place to shop till you drop! Spread over 7 acres, this open air market has everything. Clothes, shoes, accessories, tiny curios to take back home and the most amazing food market! Melbournians always try to make use of local produce in their food.The shops reflect this attitude and are stocked with all sorts of fruits and vegetables, meat, poultry, seafood and some special delicacies. The market is famous for its special jam donuts sold in doughnut van. I would love to visit the food session and walk through aisles and aisles of fresh produce, feasting my eyes and tastebuds! No surprises there! Everyone visiting Melbourne will definitely find time for this one. Floating high above with the clouds, looking down at the beautiful Yarra valley and watching the sunrise.. I am already feeling all warm and fuzzy!! MUST SEE!! MUST SEE!!! Its time to soak in the natural beauty of Melbourne. 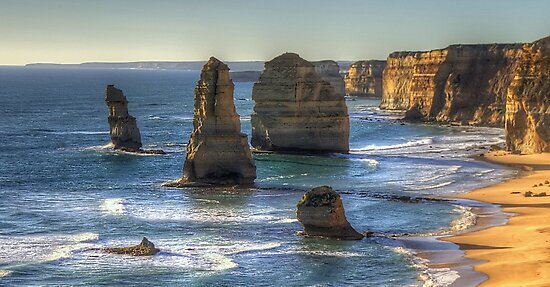 Great Ocean Road is one of the world's most scenic roads which winds through the coast of Melbourne.The famous 12 Apostles, which is a huge rock stack formation rising from the Southern Ocean, is along this stretch. The beautiful beaches of the region brimms with a variety of recreational sports like fishing ,diving and surfing. But I have my eyes on the excellent restaurants and heritage hotels of the coastal region. There is nothing like fresh seafood. Combine it with a beautiful beach and warm and friendly people and there you have a magical concotion! And yes, I almost forgot to mention, I'll be skipping through the Melbourne attractions on a TRAM!! Wuhooo.. Isn't that awesome?? :D I'm all ready with my camera and backpack for a customized Melbourne experience and it's your time to visit Melbourne NOW! There are umpteen places to visit in Melbourne and hand picking a few is a huge task.. To help you plan your very own Melbourne experience, visit www.visitmelbourne.com/in.